Google has just released a new update for the Gmail app specifically for the Android users. 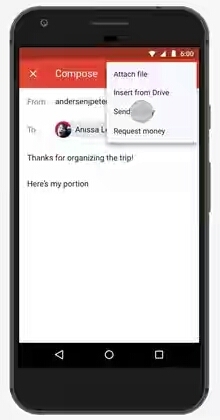 Google is trying to make sending and receiving money a lot more easier by introducing a new feature which will make it possible to send and receive money through the Gmail app. This new feature is actually based on the "Google wallet" which has been around for over four years. The Google wallet is a service by Google which makes it possible to send and receive money through Gmail web only. But with this new update, you will now be able to use the Google wallet service on your Android smartphone through the Gmail app. One other good thing about this service is that the transaction is done within the Gmail app without need for a third-party app. 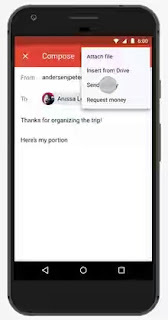 To use this new feature, just click on the attachment icon at the top right corner then click on "send money" or "receive money" depending on what you want to do.